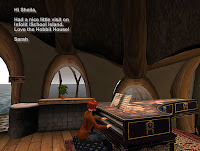 An American Humanities' academic has just written a piece praising our island, Infolit iSchool, in Second Life: you can find it here: http://educatinglotus.wordpress.com/2012/04/06/the-university-of-sheffield-uk-infolit-ischool/. She says "I applaud Sheila Webber (Sheila Yoshikawa in SL), Information Studies faculty member and Director of the Centre for Information Literacy Research, for creating a wonderfully vibrant student learning space, one that uses Inquiry Based Learning." On the right you see another complimentary message, just sent by Sarah Chauncey, Director of Information Resources and Learning Technologies for Rockland BOCES and doctoral student at Syracuse University.